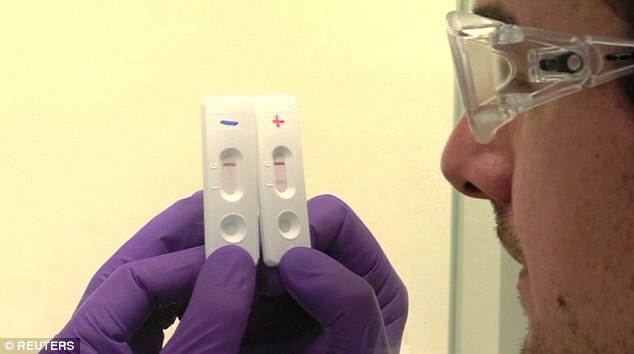 A new pregnancy-style Ebola test could give health workers on the front line in West Africa accurate diagnoses within 15 minutes, it has been claimed. French scientists are in the pre-production phases of the test, which they claim will ‘dramatically cut times’ for medical teams working in the field. The small white plastic kit is in development and resembles a traditional pregnancy test. It can be used without specialised equipment, speeding up the process of testing for the virus, the researchers from a branch of the Atomic Energy Commission (CEA) said. Current testing for Ebola does not yield results for around 24 hours, depending on the proximity to a laboratory capable of anaylsing the results, according to the team based in Marcoule, southern France. Researcher Fabrice Gallais, said: ‘This test works like a traditional pregnancy test available in a pharmacy. ‘We place a sample, a drop of blood, serum, plasma or urine, which moves towards this band. 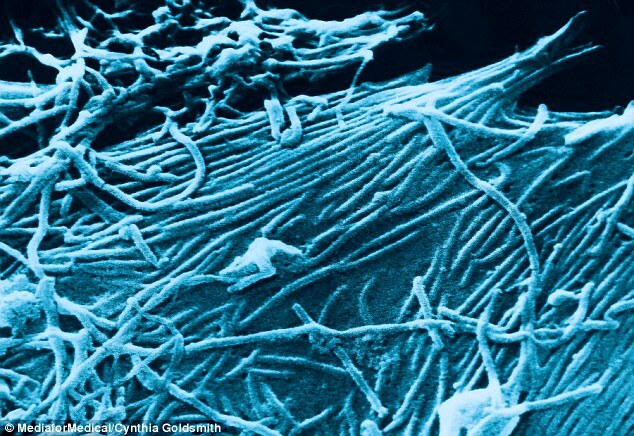 ‘The virus then gets caught by antibodies, already present on the bands. 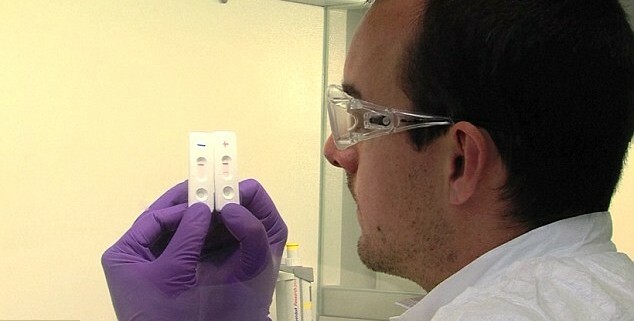 The new test has already undergone trials in a high-security laboratory in Lyon to obtain a licence, using the strain of the disease currently spreading through Guinea, Liberia and Sierra Leone. The head of the laboratory, Laurent Bellanger said he expects to begin to roll out the tests on a larger scale at the beginning of 2015. ‘We are in a pre-production phase,’ he said. ‘The tests we’re working with now are prototypes which helped us make adjustments. A vaccine to protect millions from the Ebola virus decades after it was first detected does not exist because the disease previously only affected poor African nations. The head of the World Health Organisation’s scathing conclusion came as nearly 5,000 people have lost their lives to the haemorrhagic fever – the majority in Sierra Leone, Liberia and Guinea. 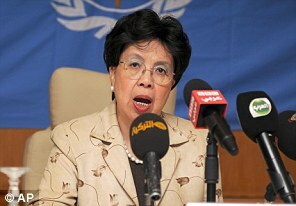 Dr Margaret Chan, director general of the WHO, criticised drugs companies for turning their backs on ‘markets that cannot pay’. She said the current outbreak – the most deadly in history – has exposed two WHO arguments ‘that have fallen on deaf ears for decades’. Addressing the regional committee for Africa in Benin yesterday, Dr Chan said: ‘Ebola emerged nearly four decades ago. Why are clinicians still empty handed, with no vaccines and no cure? ‘Because Ebola has historically been confined to poor African nations. ‘The R&D (research and development) incentive is virtually non-existent. ‘A profit-driven industry does not invest in products for markets that cannot pay. ‘We expect to have a few hundred of them in the coming days in order to start the clinical validation phase. The aim of these rapid tests is to be able to conduct diagnosis as close as possible to the affected communities. Fast tests are also under development in several other countries. Japanese researchers announced last month they found a new method to detect the virus in 30 minutes, while U.S. researchers are also working on a test that could give results in 10 minutes. The most deadly outbreak of Ebola on record has killed nearly 5,000 people, all but a handful of them in Liberia,Guinea and Sierra Leone. 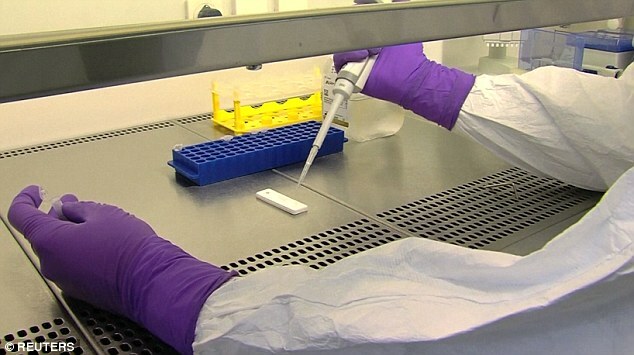 There are a number of tests currently used to diagnose Ebola. The majority work within a few days of the onset of symptoms, detecting the virus’s genetic material or the presence of antibodies against the pathogen. The most accurate of these is a polymerase chain reaction (PCR) test, a technique that looks for genetic material from the virus and creates copies of it that can be deteched, Dr Bruce Hirsch, an infectious disease specialist at North Shore University Hospital in Manhasset, New York, told LiveScience. But the test has its drawbacks. It can be negative in the first three days. Dr Sandro Cinti, a specialist at the University of Michigan Hospital, added: ‘Somebody could be in the hospital for three to five days before a diagnosis is confirmed. 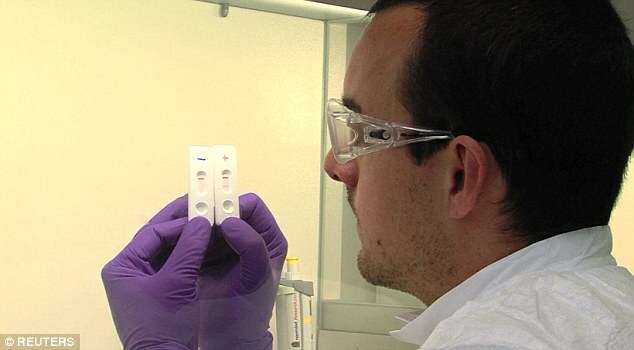 Another test for Ebola looks at the antibodies produced by the body’s immune system in response to the virus. The antigen-capture enzyme-linked immunosorbent assay (ELISA), can take longer than three days to give a positive result.